Willard Richards (June 24, 1804 – March 11, 1854) was a physician and midwife/nurse trainer and an early leader in the Latter Day Saint movement. He served as Second Counselor to church president Brigham Young in the First Presidency of The Church of Jesus Christ of Latter-day Saints (LDS Church) from 1847 until his death. 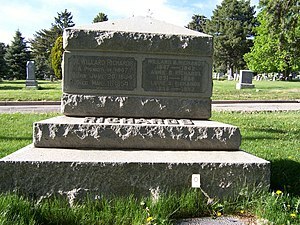 Willard Richards was born in Hopkinton, Massachusetts, to Joseph Richards and Rhoda Howe on June 24, 1804. He was the youngest of eleven children. At the age of four, he injured his head in a fall and was left with some residual muscle tremor and paralysis. As a child, Richards was very inquisitive and would read and ask questions constantly. This was especially the case dyring the six months the local congregational minister resided in his parents' household. Because of his tendency to ask questions as to why things were how they were, he was denied admission to the local congregational church. As the injury limited his physical activity, he focused his attention on education and obtained a teacher's certificate at age sixteen. He taught school in Chatham, New York, and in Lanesborough, Massachusetts. In 1823, he moved to Naussau, New York. Richards pursued additional studies in physical mechanics, science, and studied the clarinet. At age 27, he became an itinerant lecturer, traveling throughout New England giving lectures on various scientific subjects. At the age of thirty, after the death of his sister Susan, Richards decided to become a medical doctor. He studied at the Thomson Infirmary in Boston focusing on medication and herbal preparations. Richards, as a student at the Thompson Infirmary, was immersed in emergency and trauma surgery. During that time, Thompson was the hospital for hundreds of casualties of the Boston Abolition Riots of 1835. He then settled in Holliston, Massachusetts, where he practiced medicine. Richards stayed true to the Thompsonian System of Botanical treatments, a precursor to revolutionary pharmaceuticals such as Eli Lilly's Quinine. In 1836, Richards was introduced to the newly published Book of Mormon by his cousins, Joseph and Brigham Young. Richards read the book twice within ten days and, after making the necessary preparations, left for Kirtland, Ohio, to join the Church of Jesus Christ of Latter Day Saints. Richards was baptized there on December 31, 1836, by Brigham Young and ordained an elder in February 1837. Shortly following his ordination as an elder, Richards was called on a brief three-month mission to the Eastern United States. Immediately upon his return, he was called on a more extended mission to Great Britain. This put him among the first missionaries of the LDS Church to go to Britain. Richards served a total of four years on his mission to Britain. With his high level of education, Richards was often counseled by Kimball to focus on the basic tenets of the gospel. Despite this he was the moving force behind establishing the first branch of the church in Manchester. Richards met his wife, Jennetta Richards, while on this mission. They had two surviving children, a son, Heber John, born in Manchester, England, in 1840, and a daughter, Rhoda Ann Jennetta, born in 1843 in Nauvoo, Illinois. Willard and Jennetta were sealed on May 29, 1843, among the first couples to be sealed. Richards was ordained an apostle on April 14, 1840, by Brigham Young. In 1841, he moved to Nauvoo, Illinois, to be with the body of the church. He was in Warsaw, Illinois from September to December and did not take up residence in Nauvoo until December 1841. He was in Warsaw on a missionary assignment to found and supervise a settlement of Church members there. Richards organized the medical services in Nauvoo, training midwive trainers, and provided sanitation advice in particular the malaria and cholera issues. Richard was a member of the Nauvoo City Council from 1841–1843. He also was a member of the Mason Lodge at Nauvoo. In 1843 he was made recorder of the Nauvoo Municipal Court. He also became the private secretary to Joseph Smith. This was in December 1841 when he was also made recorder of the Nauvoo Temple. In December 1842, Richards was called to be the Church Historian and Recorder, a position he held until his death. In these two capacities, Richards maintained the Smith's schedule and recorded most of his activities. As church historian, he subsequently wrote a total of 1,884 pages on the history of Smith. This work was later incorporated into The History of the Church of Jesus Christ of Latter-day Saints, edited by B. H. Roberts. In July 1842, Richards went on a short mission to New England. In 1844, Richards was made the recorder of the Council of 50. On May 4, 1842 Richards was one of nine men whom Smith presented the endownment to. Richards was incarcerated in Carthage Jail with Joseph Smith, Hyrum Smith and John Taylor on June 27, 1844, when the jail was attacked by a mob and the Smiths were murdered. Taylor was shot four times and severely injured, but survived the attack. Richards was unhurt and so supervised the removal of the bodies of Taylor and the Smiths. Over a year prior to the attack, Joseph Smith had told Richards that "the time would come that the balls would fly around him like hail, and he should see his friends fall on the right and on the left, but that there should not be a hole in his garment." His first-hand account of the event was published in the Times and Seasons. Richards, his cousin Brigham Young, and other church elders left Nauvoo in February 1846, spending the remainder of the year at Winter Quarters, Nebraska. This first group entered into the Salt Lake Valley on July 24, 1847. They then went back to Winter Quarters, arriving on August 21, 1847, to gather the families for the Mormon Exodus of 1848, and deal with the malaria and cholera. Richards was called as Second Counselor to Brigham Young in the First Presidency on December 27, 1847 in Council Bluffs, Iowa. After moving to Utah, Richards trained and established the extensive 500 midwife network spread through the Deseret Territory settlements, working with Eliza Snow, the church's Relief Society General President, training Young Women and was involved in establishing the Deseret News, serving as its first Editor-in-Chief. Richards worked with Snow to identify replacement doctors among the trained young women, largely accomplished by organized delegation even to 15-year-old girls and a focus on sanitation. Snow found a young woman, Ellis Reynolds Shipp, who went to medical school then got a pediatrics specialty under the world renowned pediatrics pioneer, Victor Vaugh. In the Michigan 1881 Truly LDS, (quasi military) delegation, the combined effort of Richards, Shipp, and Snow in training and deploying an army of midwives drastically reduced infant mortality and loss of women in childbirth, especially in remote colonies. In the provisional state of Deseret, Richards served as both secretary and president of the council. Once Utah was organized as a territory he served as secretary of the territory. He was also postmaster of Salt Lake City. 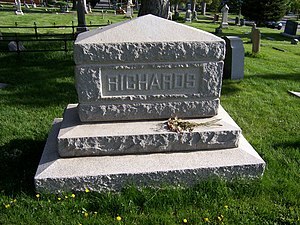 Richards died in Salt Lake City on March 11, 1854, and was buried at Salt Lake City Cemetery. ^ The Quorum of the Twelve Apostles had not had twelve members since September 3, 1837, when Luke S. Johnson, John F. Boynton, and Lyman E. Johnson were disfellowshipped and removed from the Quorum. Since that time, William E. McLellin and Thomas B. Marsh had been excommunicated and removed from the Quorum; David W. Patten had been killed; and John Taylor, John E. Page, Wilford Woodruff, and George A. Smith had been added to the Quorum. Richards's addition to the Quorum brought the membership in the Quorum of the Twelve to eleven members. ^ Haller, John S. (6 January 2019). "The People's Doctors: Samuel Thomson and the American Botanical Movement, 1790-1860". SIU Press – via Google Books. ^ Garrett, H. Dean. "Richards, Willard". Utah History Encyclopedia. Retrieved April 11, 2016. ^ Smith, Joseph. Documentary History of the Church. Deseret Book Company. p. 619. ^ "Two Minutes in Jail". Times and Seasons. Independence Press. 5: 598–9. 1 August 1844. ^ Deseret News October 29, 1857, VolVII No 21, p. 5, et. al. ^ Jenson, Andrew (1941). Encyclopedic History of the Church of Jesus Christ of Latter-day Saints. Salt Lake City, Utah: Deseret News Press. p. 187. ^ Deseret News April 16, 1859, p. 4 et. seq. "Sanitation Column" : "Treating Cuts"
^ "Our History - Pediatrics - Michigan Medicine - University of Michigan". medicine.umich.edu. Quinn, D. Michael (January 1980). "They Served: The Richards Legacy in the Church". Ensign. Salt Lake City, UT: The Church of Jesus Christ of Latter-day Saints. Retrieved April 20, 2012.